During the years 1991-93 a great deal of interest sparked. More companies wanted to participate - demands and requests became greater, causing the Honor Guard the need of a larger sponsor. In 1993 the Honor Guard presented their services to the South Hills Fireman's Association (SHFA) asking them for their support. The SHFA membership by unanimous vote created the South Hills Fireman’s Association Honor Guard. Not only did the Honor Guard membership explode from a handful of members to a total of 30 including our first drum line, but also our duties grew. While expanding our duties to parade escorts, memorial services, and funerals, etc. we formed a relationship with Donald Dorsey and the Pittsburgh Fire Fighters Local #1 Honor Guard. 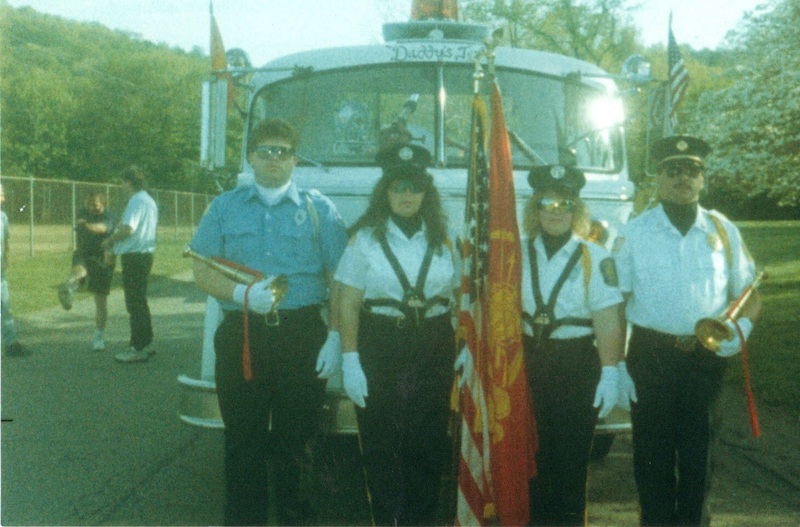 Through this partnership in 1995, under the command of Martin J. Kauer, the Honor Guard expanded its horizons and became the Western Pennsylvania Firefighters Memorial Honor Guard. Now chartered and incorporated into its own 501 c3, non-profit, charitable organization the WPFMHG expanded its services once more to include the following divisions: Fire Prevention, Emergency Services, Pipes and Drums Band and the original Honor Guard. 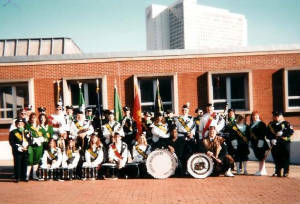 In 2001, the WPFMHG created the Pipes and Drums Band, under the musical direction of our first Pipe Major, William C. Fife. The band had grown greatly since 2001 and has become the marching pride of our regions bravest. 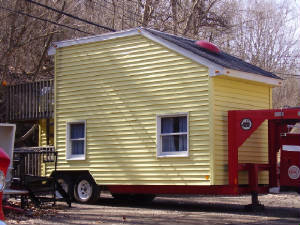 In 2003, the membership purchased a used fire safety house and utility truck from the Washington County Firemen’s Association. This was the foundation to our division of Fire Prevention. The house and equipment was made and still to this day the program remains openly available to our regions fire companies and municipalities. Also in 2003, Allegheny County Emergency Services recognized our organization as County Station 386 and gave us radio permission to operate on the County’s regional channel. Company 386 responded to its first emergency call on September 17, 2004 to Oakdale Borough to assist Oakdale EMA during the flooding of Hurricane Ivan with mobile command and incident operations. In 2007, after many years of planning and fundraising, the WPFMHG was able to purchase our very own building and headquarters, the former North Braddock No. 3 Firehouse. We were able through various raffles and grant opportunities to make the procurement possible. Much of the improvements to the facility have been completed by our own staff. Also this same year, Pipe Major Fife retired and Nichole Kauer was appointed to the position as Pipe Major. In 2009, through a grant from the Commonwealth, we were able to construct a bunk room / rec-room, equip our hall / meeting room and complete additional repairs to the building that were beyond our means. The year 2010 was a year that brought about a monumental advancement for our organization, we were able to secure a 100% funded, $97,000.00, FEMA Fire Prevention Grant that replaced our older fire safety house and expanded our Division of Fire Prevention to means that make it second to none. Now after 20 years of dedicated service, the mission of the WPFMHG remains: to support the families of fallen firefighters, while promoting citizen awareness to the dangers of fire. 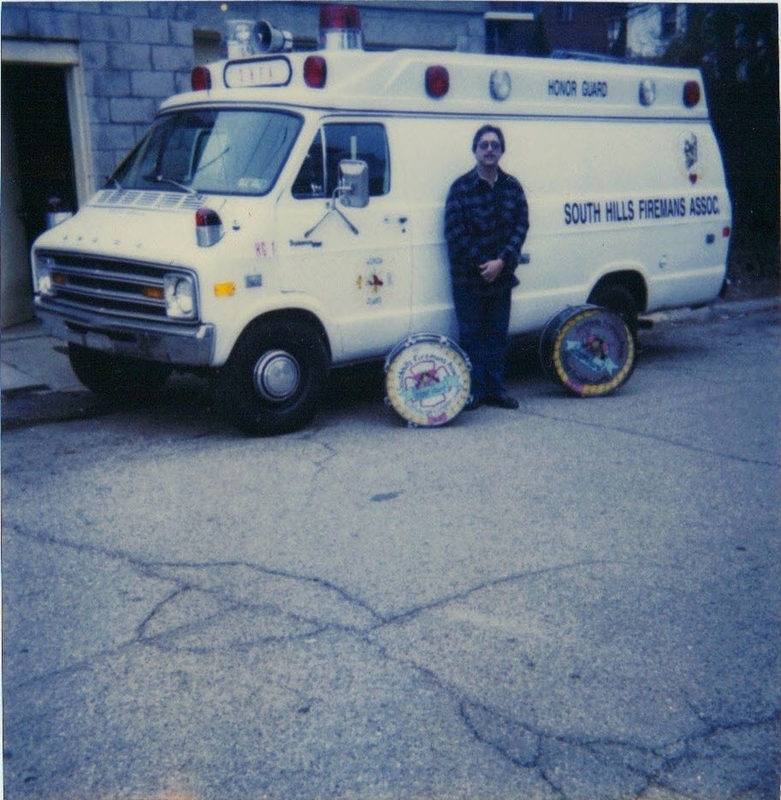 1976 Dodge Ambulance – this retired ambulance donated to the SHFA from the Scott Township Board of Commissioners / Bower Hill VFD, was our first squad. It served from mid-1990’s under the SHFA banner, through the start of the WPFM years up until approximately the year 2000. 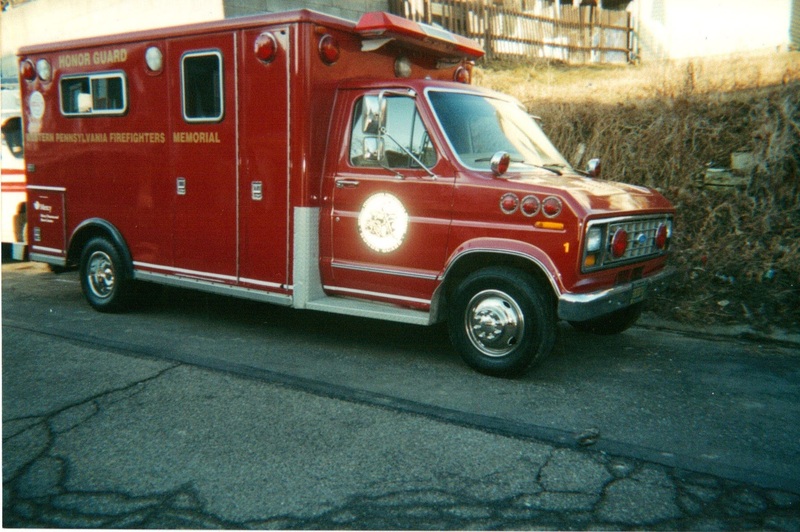 1987 Ford E-350 – this unit replaced the 1976 Dodge and was donated to the organization by Mercy Hospital. It allowed for additional storage room for our equipment, and was the first truck to be owned by the new WPFMHG organization. This unit is the first truck be given a “386” identification number as well. This truck served up until 2004. 1982 Ford E-350 / 4x4 – this was the sign that the organization was starting to grow, when we needed at least 2 trucks to get the organization to its details. This was by far the most unique piece we have ever owned. 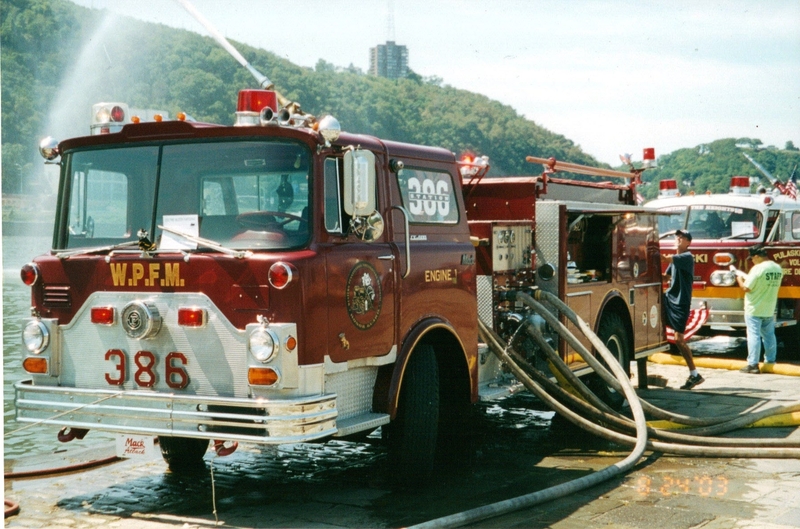 This truck, donated to us from the West Liberty VFD from West Liberty, WV, served the company from 2000-2003 when it was traded to the Seaside Heights, NJ, Fire Department for its replacement (the bus). The prime roll of this truck was to transport manpower, drum corps and drums. 1970 CF Mack Pumper, the start of the WPFMHG Division of Emergency Services. This truck was set up as a funeral coach and was made available to fire companies in need as a loaner. The first of the legendary WPFMHG “Mack Attacks” was donated to us from the Borough of Dormont, and served from 2002-2004 when it was retired all to early as result of vandalism sustained from our neighbors in the lower Glendale neighborhood of Scott Township. As result of our pride in this truck, Engine 1’s number has been retired and no other piece of our equipment will be identified as such. 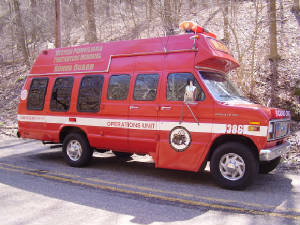 1989 Ford Bus – this unit served the WPFMHG from 2003-2010. It had seating for 11 and had many amenities we never had available before in our previous squads such as AC and a TV / VCR. 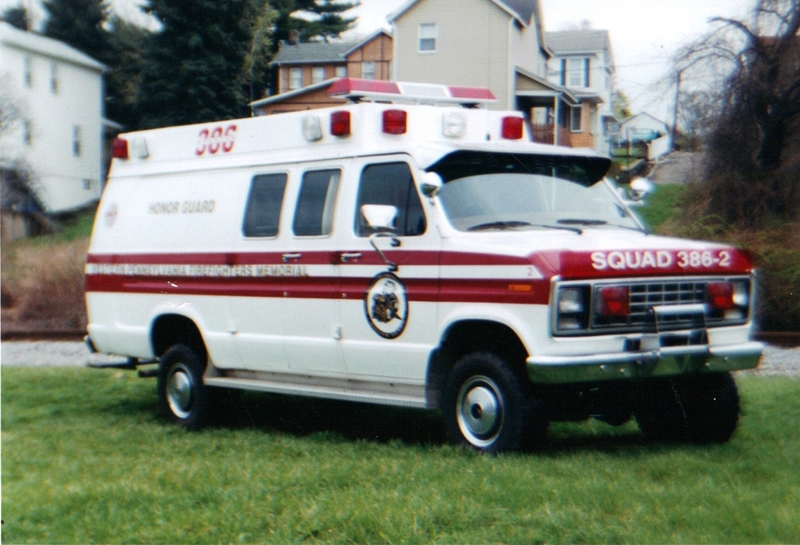 We acquired this unit through trade from Seaside Heights FD and later it was sold to a private citizen who refurbished the bus as a “Baltimore Ravens” tailgate mobile. 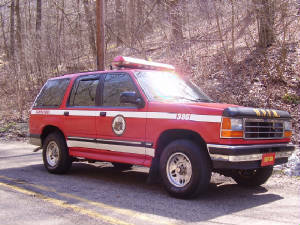 1995 Ford Explorer – donated to the WPFMHG from the Imperial VFD. This unit was used to transport small delegations of the group to smaller details and handled administrative duties of the Commander. It was sold in 2008 as its repairs out-valued the value of the SUV. 1989 Fire Safety House Trailer – this was the start to our division of Fire Prevention. Purchased off of the Washington County Firemen’s Association along with our Utility Truck in 2003, this unit we made openly available to hundreds of fire companies and educated thousands of our regions youth on the principles of fire safety. The fire safety house was retired in 2010 and replaced by the new Mobile Safety Training Unit. This old trailer was sold to the Canton Fire Department in upper-central Pennsylvania. 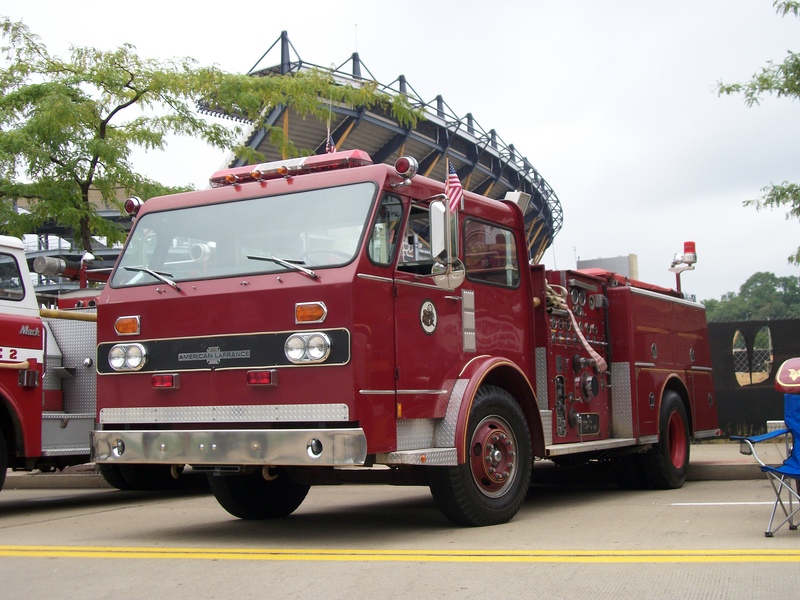 1979 American LaFrance, donated to the WPFMHG by the kind citizens and Borough Council of the Borough of Dormont. This truck served as a loaner engine and was made available our regions departments in need. This truck served from 2008-2010 when it was replaced by 386 Engine 5. Like our Engine 1, we retired the number “Engine 3”.